Minimalism has become a symbol of good taste in recent years with the resurgence of the minimalist aesthetic in fashion (Céline, pre-Hedi Slimane and Jil Sander), design and architecture (Apple and Tadao Ando), and even lifestyle (Marie Kondo). “But you can trace its roots in the minimalism art movement from the 1960s”, says Eugene Tan, director of the National Gallery Singapore, whose latest blockbuster exhibition, Minimalism: Space. Light. Object., in collaboration with the ArtScience Museum, offers a look at how the movement came about, and its development and influence on art as we know it today. “Minimalism art expanded the viewer’s experience from the confines of the object into the physical environment of the work. This led to an important transition in Western art, connecting abstract expressionism to art forms we now associate with post‑modern or contemporary art, including installation and performance art,” says Tan. Despite its importance in Western art, minimalism never manifested into a movement or tendency in Asia, when in fact, the exhibition suggests, many of the movement’s artists were influenced by Asian spirituality and philosophy, in particular Zen Buddhism with its principles of emptiness, simplicity and awareness. “When you look at the late colour‑field paintings of artists such as Mark Rothko, Barnett Newman and Ad Reinhardt, there is often a kind of immaterial or spiritual element, and the same can be said for minimalist art. This idea of immateriality and spirituality was always already present in Asian art,” Tan explains. While the term minimalism was coined in the US, with key figures such as Carl Andre, Dan Flavin and Donald Judd, the exhibition also looks at their contemporary counterparts as well as artists from the region, with some 150 works by over 120 artists. The showcase at the National Gallery Singapore begins with the monochromatic black paintings—only the handful among minimalist objects and three‑dimensional works—of Rothko, Newman and Reinhardt, alongside those of American artist Frank Stella, whose Black Painting series was one of the earliest examples of minimalism, and Japanese artist Tadaaki Kuwayama’s TK996–’60 (1960). “One of our biggest discoveries were the Asian artists living and working in New York and London, whose works resonated with what the minimalist and post‑minimalist artists were doing, but they were just never recognised. We are bringing them back into the discourse with this show,” Tan offers, citing Kuwayama and London‑based artists Rasheed Araeen and the late Singapore-born Kim Lim as examples. Known for its simplicity, minimalist art is anything but simple. Born in a decade of social change and revolution, minimalism pares art down to its fundamental elements, making it devoid of personal expression. One simply has to look at the movement’s core principles to understand. For one, works are made in simple geometric forms, often in repetition. Take Lebanese artist Mona Hatoum’s Impenetrable (2009) installation—the barbed wires on steel rods take a cubic form, revealing the potential of division and violence in everyday life. The use of industrial materials, from steel to Perspex, is another characteristic. Just like Flavin, who uses white fluorescent light tubes in his Monument for V Tatlin series (1966‑1969), Danish‑Icelandic artist Olafur Eliasson’s Room for One Colour (1997) is lit by mono-frequency lamps that suppress all colours except yellow and black, so viewers only see in shades of grey, suggesting that our perspectives change with the environment. A work is not minimal just because of the absence of colour, as artists also use a monochromatic palette of primary colours to demarcate space, rather than to express mood. Asian philosophies also continue to inspire artists from the East and West. 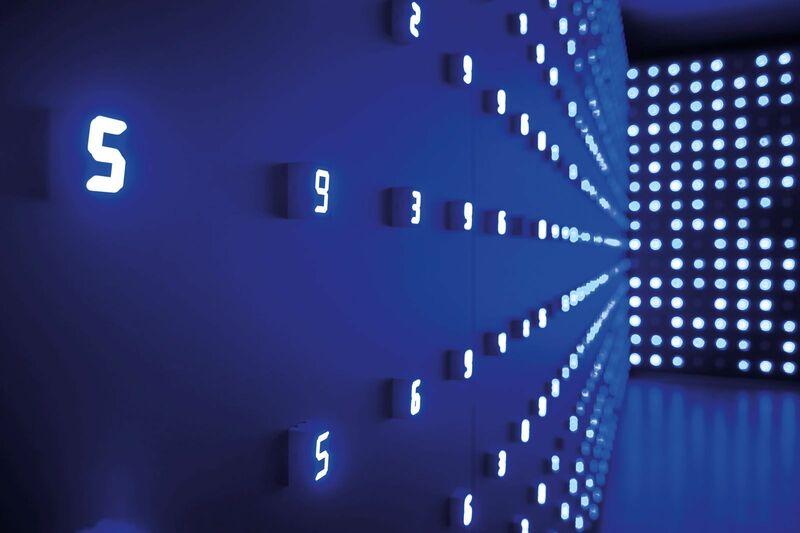 Japanese artist Tatsuo Miyajima offers a contemporary expression of the Buddhist cycle of life, death and rebirth with his installation Mega Death (1999/2016), where LED numbers count down from nine to one, with zero being replaced by a blimp of darkness—that pause between life and death. Meanwhile, spirituality and Asian art are central to the showcase at the ArtScience Museum, where the notions of the cosmological void, emptiness and nothingness are explored. And as if a nod to the museum’s circular form, the curatorial team takes inspiration from the Japanese Zen ink circle enso, with Hatoum’s Zen garden-inspired circular sculpture, + and – (1994‑2004), taking pride of place at the entrance. The work’s sweeping movements over sand evoke polarities such as absence and presence, existence and non‑existence. In the same vein, Chinese artist Tan Ping explores endlessness and formlessness with his woodblock print on paper, +40m. Sound and silence also form a major part of the exhibition here, acting as an auditory counterpoint to the visual explorations. But perhaps the most mind-boggling work is Belgian artist Frederik De Wilde’s Horizontal Depth3 – “This is Not the Place We Go to Die. It’s Where We are Born” (2018), one of the exhibition’s three new commissions. Working with Nasa scientists to engineer the blackest of black material, De Wilde’s carbon nanotube sculpture captures all light at all frequencies—the closest one can experience to emptiness. And as if such an existential experience through art is not enough, Eliasson invites viewers to wander through Your Body of Work (2011), a web of translucent coloured sheets that change colour depending on your position inside the work, giving thought to how we live and function in the world. How apt since now that we are back in an era filled with noise and clutter, perhaps it is time to pause and reflect. And this is something that the exhibition allows you to do. Minimalism: Space. Light. Object. is held until April 14, 2019, at the National Gallery Singapore and ArtScience Museum. This story was first published in Singapore Tatler December 2018.